As the academic year comes to a close, the College of Liberal Arts and Sciences recognizes exceptional faculty members who have gone above and beyond to educate the next generation of scholars. For spring 2016, the college has named three winners based on their dedication to students and substantial contributions to the humanities, natural sciences and social sciences. In addition, the college also honored Volker Benkert, lecturer in the School of Historical, Philosophical and Religious Studies, with the Liberal Arts and Sciences Outstanding Lecturer Award for 2016. Cheong has been an associate professor of digital media and intercultural communication in the Hugh Downs School of Human Communication since 2008. She teaches both undergraduate and graduate courses, preparing students to acquire lifelong learning skills. Cheong said her teaching revolves around helping students understand how people use communication technologies in their daily lives to function in our networked society. Cheong has also been a sought-after mentor for honors scholars, doctoral candidates and post-doctoral fellows. She has served as a mentor in the President Barack Obama Scholars program, the Center for the Study of Religion and Conflict, and the Undergraduate Research Fellows program. In addition, Cheong has mentored two graduate students who have won awards and received funding for their projects. Her peers have also asked her to serve as mentor for the first Graduate Honor’s Seminar organized by the International and Intercultural Communication Division of the National Communication Association. Since 2013, Looser has been a professor in the Department of English where she has taught several Jane Austen courses at the undergraduate and graduate level. Through the study of feminist literary criticism and women’s writing in a historical framework, Looser said she aims to teach students how to become better readers, critics and writers as they find their true passion. “She embodies what I believe to be the best qualities for a teacher and scholar in our unique university environment, capturing the often elusive mingling of skills and talents capable of engaging students and bringing them to their highest achievements,” said Mark Lussier, professor and chair of the Department of English. From 2013 to 2014, Looser worked with 10 students on honors contracts, all of which were based on significant Austen research. In addition, she has served on several dissertation committees and co-wrote a published piece on the scholarship of teaching Austen with a graduate student. Looser’s syllabi showcase her dedication to students’ goals after their degree programs. She combines in-class discussions with practical literary, research, library or professional skill development to better professionalize her students and render them more competitive in the complicated job market after graduation, said Lussier. 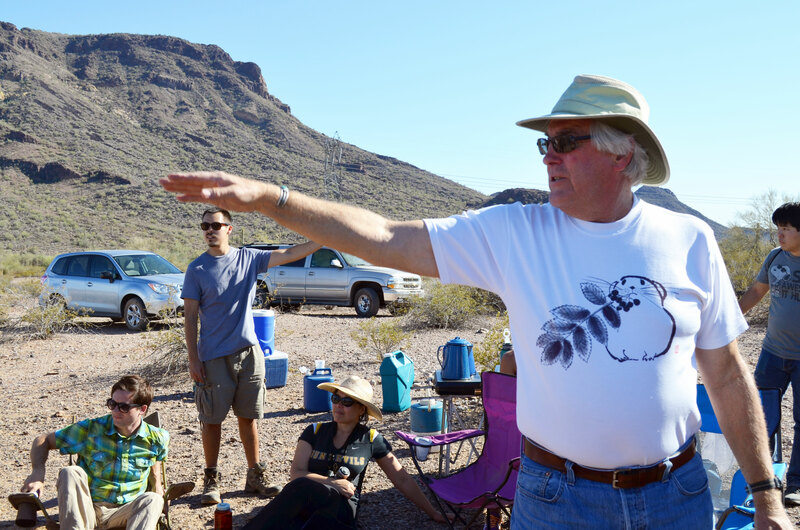 Smith has been a professor at ASU since 1978, joining the School of Life Sciences in 1991. He teaches mammalogy, conservation of biodiversity, conservation in practice and field techniques in conservation biology and ecology. Smith said he integrates international research and service experience in his teaching to enliven lessons on the impact of conservation in our daily lives. In his mammalogy course, Smith takes the class on three overnight field trips designed for total immersion in the world of mammals. He also involves other students in his fieldwork on the Tibetan Plateau and at a field camp in the Mono Craters in California. “Generating in students a passion for conservation and the confidence that they can make a difference is the part of teaching I find most rewarding,” said Smith. Smith also works closely with students to make sure they are aware of and gain placement in internships, which is essential in the field of conservation biology. He has served as ASU’s liaison for summer internships with the Arizona Game and Fish Department, facilitating the placement of hundreds of students in full-time summer positions. In addition, Smith has helped students with honors projects and mentored students who have won prestigious scholarships. Since 2007, Benkert has been a lecturer in the School of Historical, Philosophical and Religious Studies. He teaches a range of graduate and undergraduate courses, ranging from global history to Western Civilization. Benkert said his classes ask questions of great moral import to build connections between past and present in today’s interconnected world. Benkert is part of several teaching initiatives. He currently serves as the director of undergraduate studies in history and has been instrumental in implementing a new major map. He has also created four entirely new courses to place more emphasis on comparative aspects and help graduate students develop their own courses in their first-year of teaching. “I hope to create an inclusive community of excellence,” said Benkert, who served on the Fulbright Selection Committee and mentored several students in Barrett, the Honors College. Benkert’s mentoring efforts have led to a number of student awards, often enabling archival research in the U.S. and Germany. Benkert also offers individual instruction to students interested in Holocaust studies and Europe in wartime. He brings scholars to ASU to bolster these connections and draw students into scholarly conversations. Award recipients will be honored at convocation ceremonies for the College of Liberal Arts and Sciences to be held on Tuesday, May 10 at 2 p.m. and 7 p.m. at Wells Fargo Arena in Tempe. Two Ira A. Fulton Schools of Engineering student-led start-ups earned $1,500 apiece for their ventures at the Arizona Collegiate Venture Competition (ACVC) at the ASU Innovation Center at Skysong on April 8. Tech Dispatcher and Synergyan, both led by engineering students, finished in third place, tying with two student ventures from GCU and one from NAU. Tech Dispatcher’s pitch netted the team a $1,500 investment. Incubated in the Fulton Schools Startup Center’s eSeed Challenge, Tech Dispatcher is a new service aimed at providing hassle-free tech support to both businesses and individuals at the push of a button. The tech support start-up earned its spot to compete in ACVC following a successful pitch to entrepreneur Tom Prescott, former president and CEO of Align Technologies Inc., on a trip to Silicon Valley that culminated the eSeed Challenge’s first year. Competing in ACVC provided another opportunity for the company to refine its pitch with feedback from investors and network with fellow entrepreneurs. Synergyan, a biosciences company with a focus on molecular and nanoscale bioengineering and synergistic therapies, also brought in $1,500 at the competition. It was co-founded by Fulton Schools doctoral students Russell Urie and Taraka Sai Pavan Grandhi, along with ASU associate professor Kaushal Rege and Senior Research Manager Mehul Patel, who serve as scientific and business advisers, respectively. 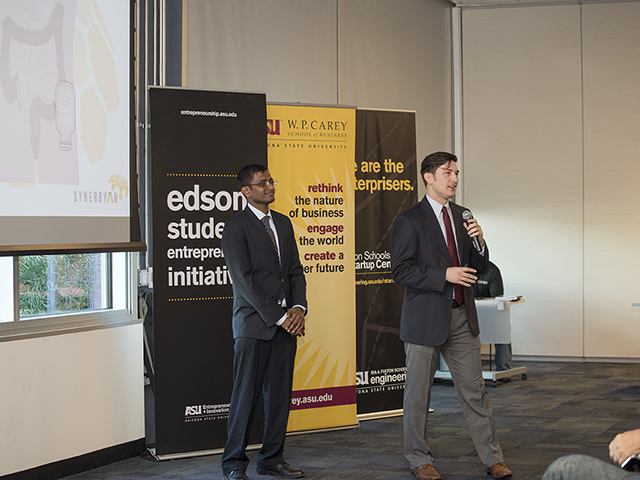 A product of ASU’s Edson Student Entrepreneur Initiative, Synergyan is already hard at work to advance the technology for its first product idea, Welseal, a novel protein-based surgical adhesive biomaterial that promotes rapid healing of soft tissue tears. At the competition, Worksphere from UA took the trophy home to Tucson and netted $5,500 along with a Draper University Scholarship. LetsChat, led by W. P. Carey School of Business students, placed second, earning $4,500 and will join Worksphere on the Draper University campus in Silicon Valley for an intensive seven-week course on entrepreneurship. “If this year is any indication, I’m incredibly excited to what will come out the next eSeed Challenge round. I look forward to watching the existing teams develop further as well,” says Brent Sebold, director of the Startup Center. Applications for the fall 2016 eSeed Challenge close at noon April 29.